Hereditary set of bells of the Holy Resurrection Church. The Holy Resurrection Church is a unique creation of the architecture of Vitebsk. 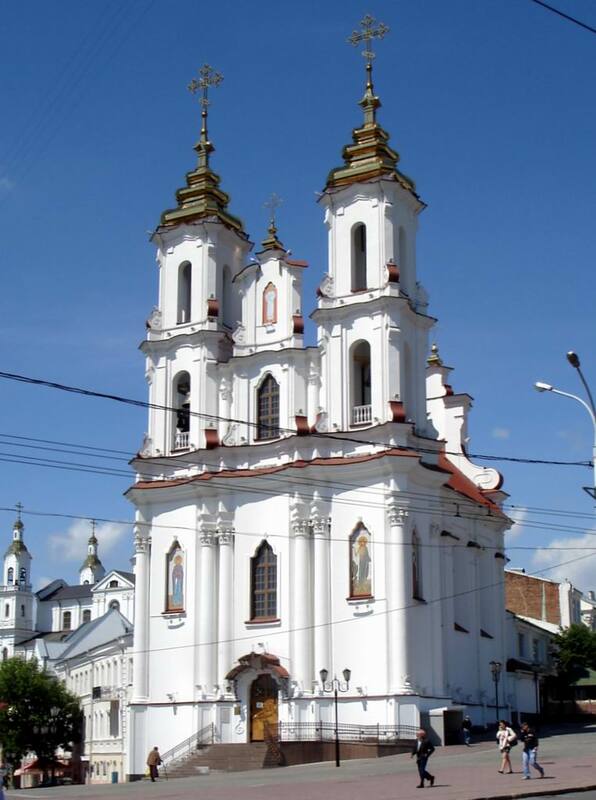 Unique painting of walls, solemn and majestic appearance and hereditary set of bells that not every church can be proud of - all this makes the relic invaluable asset of cultural Vitebsk. We all want miracles, so sometimes we try to find the unusual in the ordinary. But if you are lucky to find yourself in Vitebsk, do not be lazy to stroll along the city streets. Easy, slowly, looking at every building - and you will face an amazing and unusual architecture of Vitebsk. 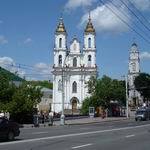 Lashing what to see in Vitebsk, come into the Resurrection Church, the first mention of which has its roots deep in the history. People associate it to the marketplace – according to the square on which the church has been earlier built. The temple built in late Baroque style differs by its particular delicacy and refinement of shapes and lines. Perhaps that is why the relic is so respected by the Orthodox Christians and distinguished among other churches in Vitebsk. Before there has been was a wooden church at this place. The exact date of the construction is unknown. In the history of the city of Vitebsk, it is first mentioned in 1558. Historians and culture experts suggest that it was built even earlier - at the beginning of the XVI century. The history always determines that a hard bumpy ride was prepared for remarkable monuments of art, including many attractions of Vitebsk. Not once burned the temple, but the church again and again, resurrected from the ruins. No one knows, when and how the wooden church in Vitebsk was finally destroyed. But the literary sources mentioned 1772 - when, instead of wooden one, local architects erected a stone church, which soon turned to the Uniates. The Resurrection Church has been restored by donations from local merchant Nicholay Smyk. Some sources say that the project was developed by Jan Glaubits - an outstanding architect of the Grand Duchy of Lithuania. The believers bear a legend, and the history of the city of Vitebsk recognized this fact, as if the church was famous for unprecedented painting and unique architecture and was one of the main Uniate churches in Vitebsk at that time. Napoleon Bonaparte in summer 1812 during his stay in Vitebsk was amazed by what he saw. Therefore, he did not rob the Resurrection Church, and located a hospital here. The church remained Uniate until 1834. 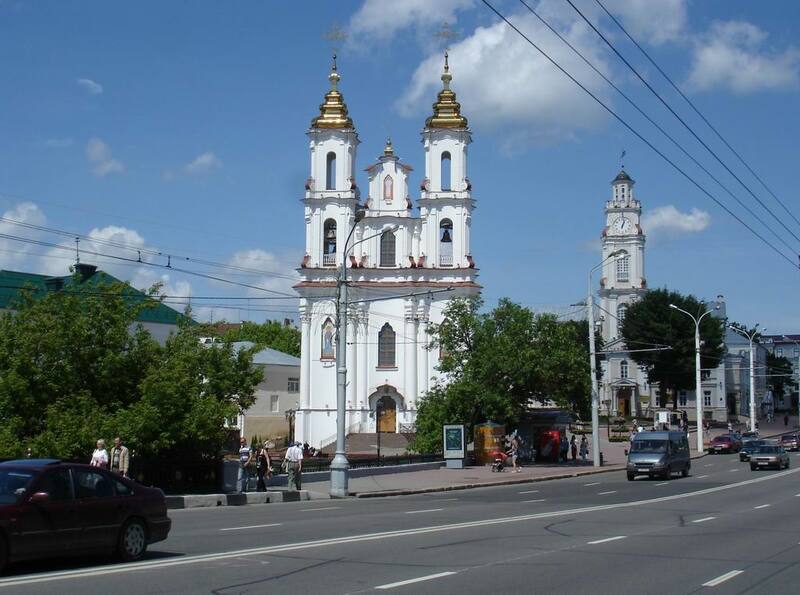 Then the church completed the list of Orthodox sights in Vitebsk. In 1841 it was rebuilt according to the Orthodox canons. As a result, a triangular pediment appeared at the front facade, three-storied towers were built, and the roof was adorned with a wooden octagonal drum. As a result, the temple as if stretched out over the square and over the existing urban housing, becoming an important and necessary element of the ensemble of the city of Vitebsk. The Divine Liturgy in the Resurrection Church had been held until 1936. This milestone was fatal to the life of the relic - it was completely destroyed on the order of the local authorities. The main reason was that it was impossible to organize movement of public transport because of the church. It hurts that the disappearance of the Resurrection Church has not passed without a trace in the cultural life of Vitebsk: the unique frescoes were destroyed. The fact that they were of particular value is confirmed by not only the history of Vitebsk. There is also the conclusion of the Imperial Archives Commission, which in 1913 issued a permit to repair the church, but with one condition: to save the existing frescoes on the walls. After the collapse of the Soviet Union it was decided to restore the Resurrection Church. When rebuilding the temple the drawings of artist Joseph Pawns and Vitebsk photographs of that time were carefully examined. The preserved remains of the foundations allowed to determine the thickness of the walls of the destroyed temple - 90 cm. But, unfortunately, the original foundation was unable to save. The construction of the Resurrection Church began in 2001. Soon according to the project of Igor Rotko the Orthodox Church appeared as it was in the late XVIII century. However, the roof was somewhat changed: a small tower with a dome was built in the centre. And the second dome appeared, which is visible only from within. Although this does not derogates the importance and role of the Resurrection Church in the collection of attractions and cultural heritage of Vitebsk. The construction of the temple was carried out by donations from citizens. Each person could buy a brick with his name written for the construction of the church. Outdoor finishing work was completed until the end of 2008. At the same time images of Christ, the Virgin Mary and the saints appeared in niches of the walls of the Resurrection Church, at the height of more than 20 meters: some statues were lifted by hand, others - with the help of a crane. Already in May 2009 the church bells talked with loud voices. There are 11 of them in the Resurrection Church – different diameter and pitch. The largest weighs 1,2 tons and the smallest – only 8 kg. Among the available bells there is unique one: it was cast in Holland in the early XIX century. In 2003 it was seized by the Customs while trying to smuggle across the border. The interior of the church no less rich and luxuriant, so the temple is a priceless legacy in the architecture of Vitebsk. It is worth to note the frescoes painted by Vitebsk masters and stunning frescoes "The Descent of Christ into Hell", performed by Vitebsk painter Sergei Petrov. Not far from the Resurrection Church other Vitebsk attractions are located. It's Holy Assumption Cathedral, City Hall, Art Museum, Mayakovsky Public Garden. More information about Vitebsk architectural monuments can be found at city portal VitebskCity.by. Address of the Resurrection Church: 2 Suvorov street, Vitebsk.